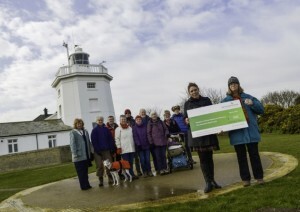 Despite being something of a “toddler” two years since taking its starting steps Cromer’s Walkers are Welcome initiative is well into its stride. The national scheme, that actively promotes walking, launched in the town in 2014. Since gaining the accreditation the Walkers are Welcome Cromer group has been encouraging residents and visitors to experience the scenic delights of the north Norfolk coast. Discount vouchers launched with local businesses are being issued with the Cromer to Sheringham pocket walk packs. The first vouchers have been provided by outdoor clothing and equipment store Mountain Warehouse and Cromer based Argus Video and a new walk is due to be published shortly. A grant has been awarded by Cromer Town Council and members recently received a £250 donation from retirement home builder McCarthy & Stone. Last year the group installed five large map and information boards around town and at the bus and train station encouraging visitors to ‘walk Cromer’ and make use of public transport. Walkers are Welcome chairman Siri Taylor said: “Cromer is the hub for access to a superb range of footpaths and National Trail, as well as many more local walking routes. “We are delighted that many local traders and accommodation providers are displaying our window stickers, encouraging walkers to stay, shop, take tea, or enjoy a delicious pint, muddy boots and all. She added: “We are looking for more businesses to add vouchers to the packs, the scheme is free to enter and should encourage more customers through the door. The pocket walk pack is available from the North Norfolk Information Centre in Cromer price £1.